A frizzy-haired, twelve-year-old girl with braces browses the endless aisles of books at a local bookstore. She glimpses covers and scans pages until suddenly a book with a woman in a large green hoop skirt catches her eye: Scarlett O’Hara in Gone with the Wind. After skimming the contents, she decides to buy the novel and hopes the contents prove as interesting as the larger- than-life character on the cover. A love for the book, and subsequently the movie, will ensue. Over the course of several years she will spend too much money on a Halloween costume to dress as Scarlett, buy a hand-painted poster found in a small boutique, take pictures next to action figures from the movie, and collect every special-edition magazine that does a feature on the film. This same girl, four years later, will pre-order tickets a month in advance to attend a special viewing of Gone with the Wind in a theatre two hours away. This young impressionable girl happens to be me. From the moment I opened Margaret Mitchell’s Gone with the Wind, there was no turning back. I was completely hooked. I fell in love with the characters, strong-willed Scarlett and presumptuous Rhett, the setting, spanning from just before the Civil War to the Reconstruction era, and how the story showcases human conflict, morality, ethics, strength, willpower, overcoming major obstacles, and many more. Mitchell craftily and ingeniously depicts the transformation of the Old South’s plantation culture from its high point to its demise. 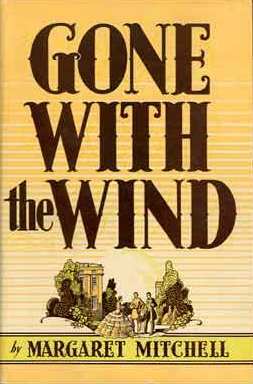 Gone with the Wind was published on June 10, 1936, and has since become one of the most popular novels of all time. In fact, a 2014 poll by Harris Interactive found that Gone with the Wind was the second favorite book of Americans, only preceded by the Bible. In July of 1936, David O. Selznick purchased the rights of Gone with the Wind for $50,000 in order to adapt the book for the big screen. The nearly four-hour movie premiered December 15, 1939 in Atlanta. At the following Academy Awards in 1940, Gone with the Wind won ten Academy Awards, including Best Picture, Director, Actress, Supporting Actress, and Screenplay. This year, 2014, marks the 75th year of the film. To celebrate the 75th anniversary, Gone with the Wind was featured in select cinemas nationwide in a special two-day event. Within days, tickets were already selling out. I was barely able to secure three seats for my parents and me for a 3:00 p.m. showing on a Sunday afternoon. As lights went dim, a silence fell over the entire tightly packed audience as we all sat, mesmerized by the colossal screen that portrayed trimmed, lacy hoopskirts of all colors and sizes dancing from one end to the next. The sights and sounds of Tara, plantations, and carriages swirled around me, transporting me to 19th-century Georgia. Immersed in the film, I abruptly jolted up out of my seat when after more than two hours the screen read “Intermission” in large black letters, I checked my surroundings: I had completely been unaware of the multitude of people that had filed in after the movie had begun. All of the red velvet seats in the spacious theatre were filled. Fully sold out. I eagerly found my seat and settled in my seat cushion for the remainder of the movie. Suddenly I see Scarlett on her porch at Tara fill up the movie screen. As she gazes out into the horizon, I feel as if she’s examining the number of people that had come to watch her story. The film continued on for another hour and a half, and when we finally shuffled out of the theatre, the sun was already setting. I greedily searched for a movie poster to snap a photo with, but much to my dismay, could not find one, which surprised me. In spite of the fact that the movie was scarcely advertised, it was well attended, its audience ranging from youth to seniors. Gone with the Wind is a classic that transcends the ages and did not need posters and trailers all about the theatre to gain attention. People flocked to the theatres to watch a celebration of 75 years of strength, will, and “gumption” (Scarlett’s favorite word). Gone with the Wind is more that just a film: it captures the spirit of a group of people who endured theft, death, burning, and bombing, who manage to survive due to sheer will and perseverance.